Just 150 miles west of Williamson County is the New Madrid seismic zone, a fault system that has the potential to affect numerous central and southeastern states, including Tennessee. Franklin Fire Marshal Andy King says that although Middle Tennessee is well within range of a large-scale New Madrid earthquake, many people in the area aren’t prepared. On Thursday, April 28, at 10:15 a.m., City Hall employees will participate in the Great Central U.S. ShakeOut, an earthquake drill that will take place in 11 states, and they are inviting others to join them. City and fire department officials are urging businesses, schools, and residents to get involved. More than 2 million people in Alabama, Arkansas, Georgia, Illinois, Indiana, Kentucky, Oklahoma, Mississippi, Missouri, South Carolina and Tennessee have signed up to participate in this multi-state earthquake drill. King is encouraging other Franklin businesses and organizations to sign up to participate at www.shakeout.org/centralus, which also has free earthquake drill manuals and disaster preparedness information available. King noted that this is the first major earthquake drill to take place in this area. 1. DROP – Immediately drop to the ground where you are when the earth starts shaking. Earthquakes occur without warning and you will never know if the initial earthquake jolt will turn out to be the start of a big one. Drop before you know. 2. COVER – Take cover by getting beneath a sturdy table or desk or dropping to the floor near an interior wall, and cover your head with your hands and arms. If there isn’t a table or desk near you, cover your face and head with your arms. 3. HOLD ON – Hold on to something sturdy and stay where you are until the shaking stops. "This will probably be the first time many Tennesseans have participated in an earthquake drill,” said King. “But a significant earthquake in West Tennessee would impact us, and we need to be prepared. Although our region does not expect significant structural damage, we should prepare for the possible loss of power, water, and disruption of other essential services.” King said that the Federal Emergency Management Agency recommends that everyone should have a personal emergency plan that allows them to survive for up to three days without assistance. He said the www.ready.gov Web site is the best source for information to help families develop their plans and determine what supplies they will need. According to the U.S. Geological Survey, during 1811-12, the central Mississippi River Valley was violently shaken by a series of three earthquakes above a magnitude 7, and up to 200 aftershocks between magnitude 4 and 7. 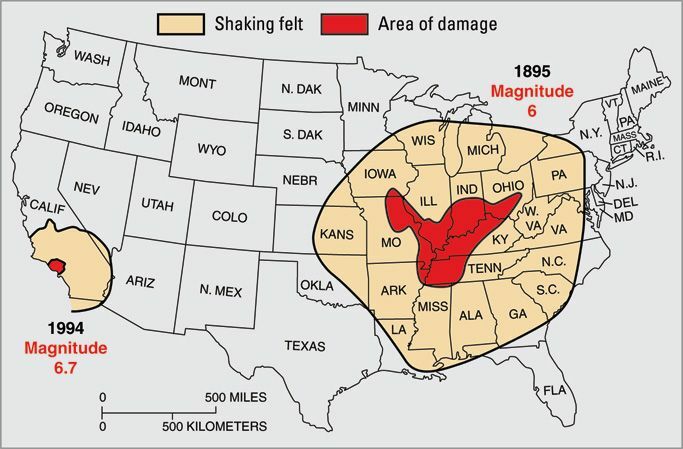 A similar risk exists today in the New Madrid seismic zone, which threatens Alabama, Arkansas, Illinois, Indiana, Kentucky, Mississippi, Missouri and Tennessee. Recent projections by the U.S. Geological Survey place the likelihood of a magnitude 6 or higher earthquake at about 25-50 percent over the next few decades, whereas a magnitude 7 or higher has a 10 percent chance of occurring.